Instead, book a room that&apos;s conveniently close to the airport the night before your flight. Many hotels come with complimentary parking, breakfast, and a ride to the airport. You can wrap up your holiday shopping, enjoy some family fun and raise your spirits at one of the area&apos;s many fine restaurants. Find the perfect place to stay during your winter holiday. If you are leaving town for the holidays, choose from the selection of Park, Stay and Fly hotel packages below to start your vacation off right! Celebrate the winter months with comfort food and family meals. 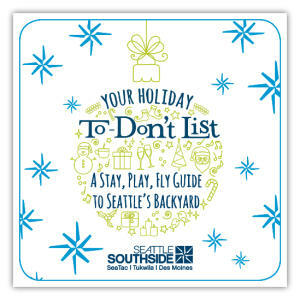 Snowy activities or cozy indoor attractions abound in Seattle Southside during the winter months.